Despite of the failure of the Copenhagen Summit in December 2009 the world will move forward with plans to limit greenhouse gas emissions much more aggressively than before. The Copenhagen Accord makes reference to the 2�C target as a potential goal for global climate protection. Moreover, it indicates that this goal will be evaluated by 2015 including a consideration of strengthening the long-term goal, referencing various matters presented by science. It seems that the scientific debate on the feasibility of a high chance of achieving the 2�C target will become important over the next few years. It is open to debate as to which extent such a low stabilization target can technically be achieved and at what costs. Therefore, a good understanding of all the major mitigation cost projections is of the utmost importance. 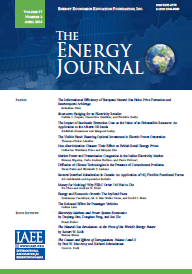 Published in Volume 31, Special Issue of The Quarterly Journal of the IAEE's Energy Economics Education Foundation.